On this Presidents Day, I’d like to honor some of the men who filled that post with integrity. Let’s forget, for this one day at least, those who degraded the office and focus instead on those who gave it a degree of eminence. One must always begin with the man who set all the precedents for what a president should be: George Washington. At the end of the Revolutionary Era, in the midst of economic chaos and a woefully weak central government, Washington came out of a long-deserved respite from public affairs to preside over what we now call the Constitutional Convention, knowing full well that the improved government structure that would emerge would undoubtedly place him at its head. With humility, he undertook this new responsibility even though he would have preferred to remain at Mt. Vernon. No one else commanded the respect he had earned, and no one else could have kept the nation as united as he did during these shaky years. Washington had to navigate the rough waters of the effects of the French Revolution and had to ensure the government survived its infancy. He did both superbly. He then left us with his Farewell Address, a document of wisdom that we would do well to heed: avoid a party spirit; maintain the religious foundation of our society. Our fourth president, James Madison, made his mark on the new nation long before he assumed the presidency. He was the greatest student of government among all the Founders. At the Constitutional Convention, he was the one who brought with him a plan for the new government. That plan became the basis for the debate; most of what he wanted came to fruition. During his tenure, the nation went to war again with Britain. There were some missteps during that war, and he did have to leave Washington, DC, in a hurry as the British invaded. Yet, when it was over, American nationhood was secure. In my view, Madison’s too-close association with Jefferson led him astray for some years before becoming president, but his later life showed a return to his former principles. One of his legacies is the notes he took at the Constitutional Convention. They are now published and give us an insight into all the debates. More than merely a historical document, those notes are a window into the early American soul. Madison gave us a great gift. I cannot omit Abraham Lincoln in this list of worthies. Yes, I know the unreconstructed among us think he was a tyrant. In my earlier years, I tended in that direction as well. Then I did research. Lincoln faced a national emergency that has dwarfed all the others, before and after. How does one maintain constitutional integrity in a circumstance where the Constitution offers little guidance? Lincoln tackled it with a rare combination of firmness and mercy. Lincoln’s tragic assassination ended that hope, as the next decade was filled with the bitterness and resentment that he sought to avoid. To those who don’t like Lincoln, I urge a second look. This was a man of integrity. Liberals love to make fun of Calvin Coolidge. They don’t really know the man. Thrust into the office by the untimely death of Warren Harding, Coolidge took over with a quiet and calm demeanor. His first action when hearing of Harding’s death was to kneel with his wife by their bed and pray for wisdom. The scandals of the Harding administration might have doomed the Republican party if a man of lesser character had inherited the office. Coolidge, though, made sure that all who were guilty were exposed. He also believed firmly in constitutional limitations on the federal government, restoring a limited-government approach that had been shoved aside in the Woodrow Wilson years. The economy flourished during his administration as he sought to reduce the tax burden on individuals. Many want to blame him for the Great Depression that followed, but that was the result of many other decisions, some of which can be laid at the feet of the Federal Reserve actions during the decade of the 1920s. If only more presidents had that perspective. Finally, I come to the president I consider to be the best of the twentieth century: Ronald Reagan. I’ve written so much about him in this blog already that I probably can’t come up with anything new. Yet it’s worth repeating that Reagan did see the world through the Christian framework and wanted to make sure his actions were right before God. He took over the office at a time when we were pretty despondent as a people. Historian Paul Johnson calls the 1970s “America’s Suicide Attempt.” That is an accurate description, in my view. 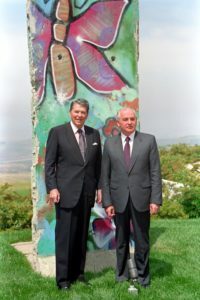 Reagan restored confidence, but not in the superficial manner of Franklin Roosevelt. He actually promoted policies that made a difference, bringing us out of the doldrums. 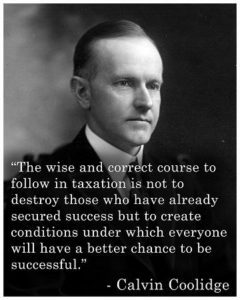 It’s instructive that he looked back to Coolidge for inspiration with regard to tax cuts and getting the federal government out of people’s lives. He dealt wisely with the Soviet Union, declaring it would soon be on the ash heap of history. The know-it-alls called him stupid for saying this, but he turned out to be right. When he died in 2004, after a decade-long bout with Alzheimer’s, his passing brought out the best in our country. The respect shown at that time probably won’t be equaled by the passing of any future president. Ronald Reagan always brought out the best in us. So, as you go about your everyday activities, give a thought or two to those who have held the presidential office in high esteem and who gave it the kind of respect it deserves.